This deliveryman serves up pizza and justice. 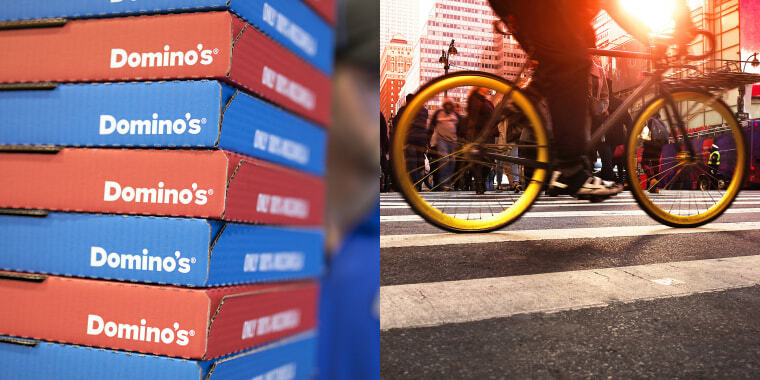 Domino's pizza deliveryman, Alou Bathily, was en route by bicycle to deliver a pizza when he made a quick pit stop — to deliver a thief to New York City police. And he still managed to the honor 30-minute guarantee on the pie. Bathily, a 21-year-old Domino's employee, was peddling from a Domino's on the Upper West Side of Manhattan on Mar. 29 just before 6 p.m. when he spotted a police chase, CBS2 reported. The man being chased, who turned out to be 17-year-old Lovell Ambrister, took off when officers spotted him and yelled at him to stop. Ambrister was one of six people police were tracking down. About an hour prior, they'd been reported harassing a woman, pulling her hair and ultimately stealing her headphones. Although Bathily did not know the backstory, he could see that an accused criminal was about to get away. Bathily — who moved to the U.S. only two months ago, hailing originally from West Africa — charged forward on his bike until he got close enough to the suspect to pounce on him. Bathily said the man tried to escape his grip so he threw him on the ground and sat on him until police caught up. When police made their official arrest and put Ambrister in jail, they told CBS2 there was more to the story than just the harassment and robbery. As he ran, they saw him empty his pockets filled with counterfeit $50 bills, which he'd been using to buy items and then return them for actual money. He was charged with robbery, forgery, petty larceny and trademark counterfeiting. TODAY Food reached out to Domino's headquarters, Bathily's store and the NYPD Communications Department for comment Monday afternoon and did not yet receive a response. This isn't the first time a Domino's deliveryperson has gone above and beyond their required duties. One dedicated employee delivered his pizza on foot after his car broke down in Michigan. Another young man was honored by Domino's (and Taylor Swift) after he helped cops rescue a captive woman. Needless to say, everyone is grateful to the food-service men and women who go the extra mile ... and not just because they bring dinner.